While I think the 2DS has a place as a budget-friendly, kid-friendly alternative to the 3DS, I could never see myself buying one unless it was just to add to my videogame collection. The 3DS XL has 3D screens (if you’re into that like I am), bigger screens, and it folds in half to protect those screens. The 2DS just looks bulky, albeit more comfortable. But oh lordy, Nintendo keeps putting out more limited variants of its handhelds, and even though I already own great-looking systems, I keep wanting to spend more money on things I don’t need. 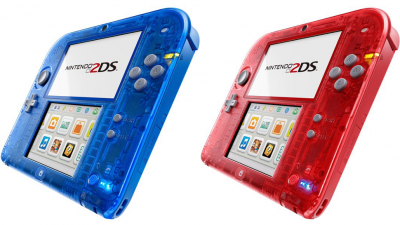 These red and blue 2DS systems are coming out in Europe on November 28, bundled with a copy of Pokemon Omega Ruby and Pokemon Alpha Sapphire, respectively. But the coolest thing about these is that their plastic is transparent. These days, transparent plastic couldn’t hope to compete against the sleek black, white, and silver design elements popularized by companies like Apple. But when I was growing up, you definitely got extra cool points among your classmates for having a transparent Nintendo product. Seeing all the circuitry inside your videogame system was like peeking behind the Wizard’s curtain. There were transparent models of the Game Boy, Game Boy Pocket, and N64 controller, but the most common transparent system was the Game Boy Color, in the popular Atomic Purple color, naturally. But as Apple reemerged with the trendy iPod, Nintendo dropped the transparent plastic that screamed “90s” and went with sleeker hardware like the Game Boy Advance SP, Game Boy Micro, and Nintendo DS, with the white plastic of the Nintendo DS Lite finally arriving at overt imitation of the iPod. The last transparent videogame system I commonly saw was the original Game Boy Advance, with its transparent Glacier color (a slightly purple-ish blue, which I guess was the replacement for the popular Atomic Purple). While I doubt Nintendo made these transparent 2DS systems for their older fans, I couldn’t help but smile when I saw them. It makes sense that they’d do this for the 2DS, which is marketed to kids who might think the design choice is cool (considering how uncool the 2DS looks to adults). But even though I’m not a kid, I think I would happily toss away $100 to add such an appealing, nostalgic piece to my collection.